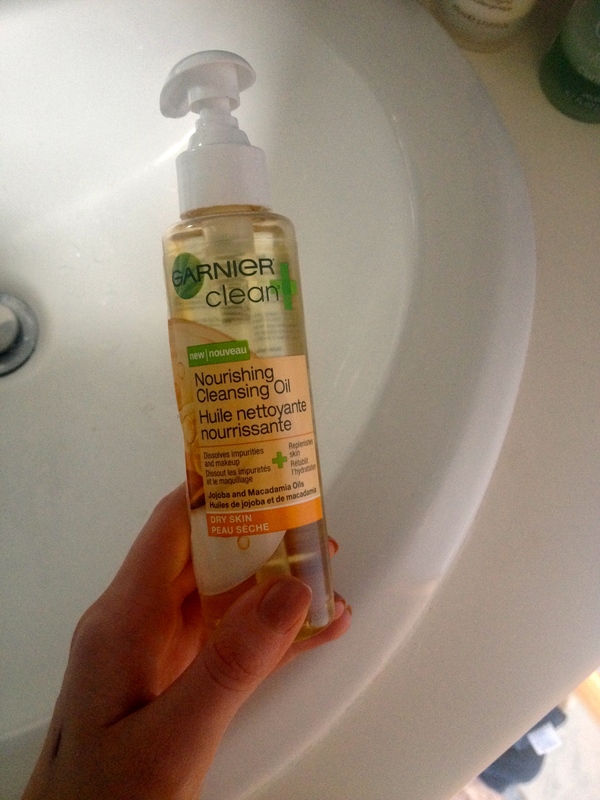 The product is actually formally/technically called the Garnier Clean + Nourishing Cleansing Oil and in my experience at least, it seems to retail for $10-12 in Canada and for a few less dollars in the US and contains 125 mLs of product. It is marketed to instantly dissolve impurities and long-wear makeup and impurities whilst replenishing the skin’s moisture balance with the macadamia and jojoba oils and all insignificant marketing details aside, I agree that it achieves on the claims. Although the formula does contain some fragrance, it removes every little last bit of makeup on my face without irritating my skin in the slightest and instead soothing it. When this is massaged into my dry skin with my fingertips, later emulsified with water and removed gently with a damp washcloth, my skin does not require a second cleanse and is left already calmed and hydrated once removed – I wouldn’t say that this is a residue of sorts as it doesn’t feel heavy on the skin or anything of that sort and it does not clog in the slightest but I supposed the moisture and nourishment left behind could be a bother to someone with an oilier skin type and then i would be prudent to follow up with an additional cleanser to remove the residue. However, the main ingredient in this cleansing oil is mineral oil, so don’t assume otherwise because the other oils are discussed in their claims; mineral oil is said to make some break out but it is generally classified as non-comedogenic and removes makeup gently and effectively, avoiding irritation. Since using this nightly to remove makeup, I can say that my skin is less irritated and that it has not caused any sort of adverse reaction in my easily-irritated skin. Also, it is gentle enough to remove eye makeup without stinging my sensitive eyes but it does blur my vision so I opt for Bioderma and just use this on my face. There is definite room for improvement with the whole packaging situation at hand. The packaging leaks like nothing else which is extremely inconvenient even when it remains in the bathroom, as oil can kind of gather around the container in notable quantities over time. Presumably in part due to mineral oil in the formula, the product has a really runny consistency that can easily slip out of your hands and into the drain if you’re not careful. All in all, this is an excellent cleanser for those of us on the drier end of the spectrum and while it’s not ‘holy grail‘ for me, it has turned into a nice staple especially at its price-point. The bottom line: This cleansing oil is nourishing, removes makeup like a dream whilst soothing the skin effectively. What cleansing oils have you tried and what are your thoughts on them?